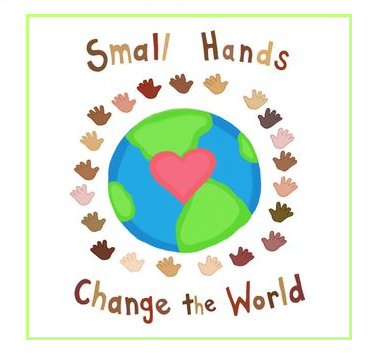 Here’s a great project for Earth Day or a summer camp or group play activity. It’s a fun way to combine recycling and reusing materials with discovering rhythm and creative music-making. A while back, we did a post about rhythm trees and you can find that listed below. But since we also get questions about the best components for this project, we thought we’d share a list here, just in time for outdoor musical fun. And remember, if you don’t have the perfect music tree, you can also do this project on a clothesline or between poles on a playground. So here’s our top suggestions. 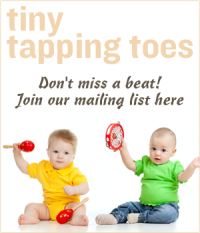 These sound great and provide a nice large surface for tapping and drumming. 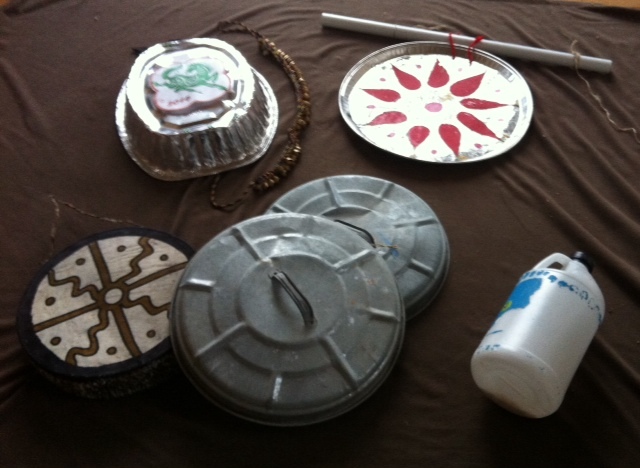 Look for used metal containers such as turkey pans or pizza pie plates. 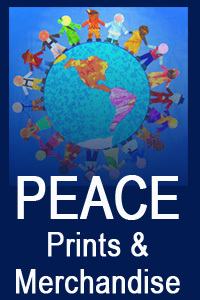 They can be painted and decorated and hung at various heights from your tree or clothesline. If you can find trash can lids or used pans or pots that aren’t too heavy, they might make a nice addition to the project as well. Clean a large plastic container and add some rattling components inside. 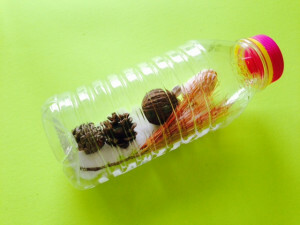 Decorate the outside of the container, if you like as well. Seal it up and hang it for a nice sound when tapped. 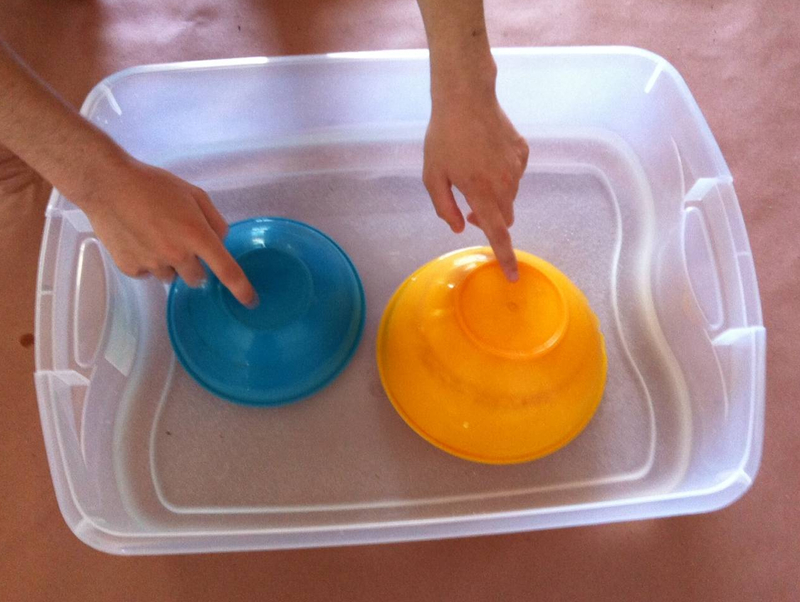 If you hang it low enough, kids can also grab and shake or “swoosh” the container for a different kind of percussion sound. Threading together wrapping paper or poster tube rolls makes for a giant guiro. Take a stick or a whisk and brush it down the sides for a fun repeating percussive sound. If you can find a large tube like these, you can hang it up and play it like the type of log drums found in Africa, the Pacific Islands or the Northern Native American tribes, like the Inuit. 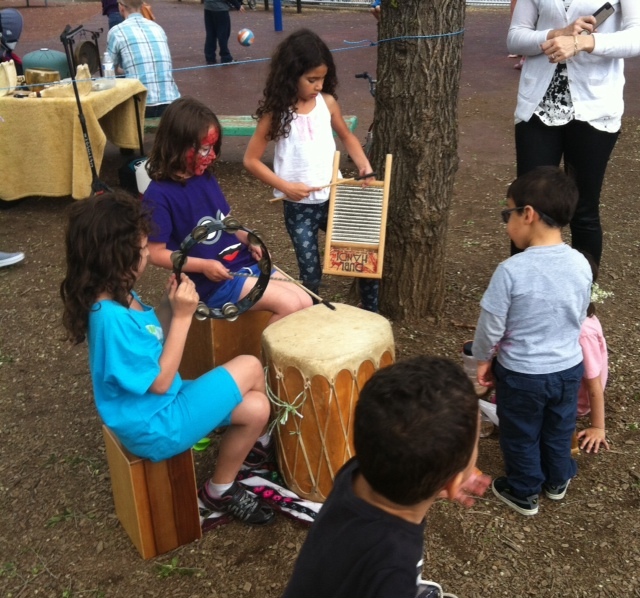 Tapping different sections of the drum will produce slightly different sounds – what fun! Some of the instruments you hang can be tapped or played with your hands. 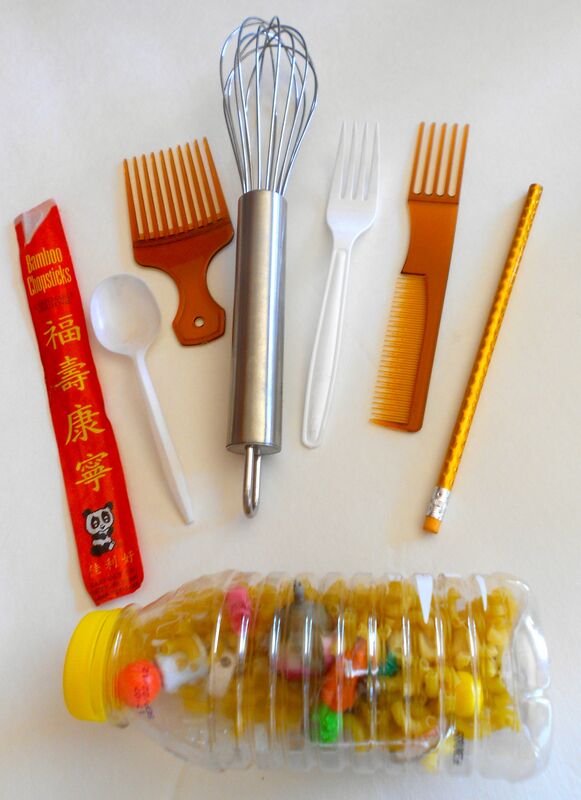 Easy mallets can also be created from wooden dowels, wooden spoons, sticks, unsharpened pencils, plastic spoons or forks, hair picks, chopsticks or similar objects. 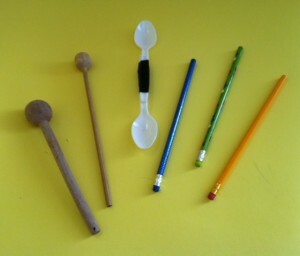 What Else Can You Find To Make Music With? 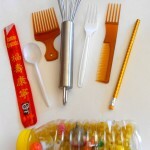 The best part of this project is seeing how creative kids can be with everyday items. Encourage your little ones to come up with suggestions of what else might become part of an amazing and fun musical tree. 7 Awesome Summer Music Ideas! Will you be going camping, hosting a summer camp or just having a staycation in the great outdoors of your big backyard? If so, music may be one of the creative activities you can include to make it even more enriching, fun and memorable. 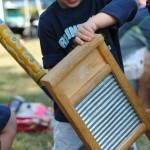 Here’s a compilation of our most popular “making music outdoors” posts. 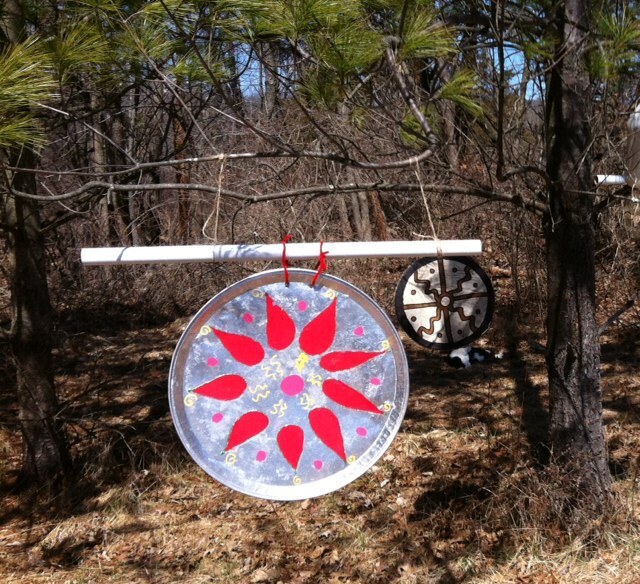 A Music Tree Or Rhythm Clothesline For Outdoor Musical Fun! 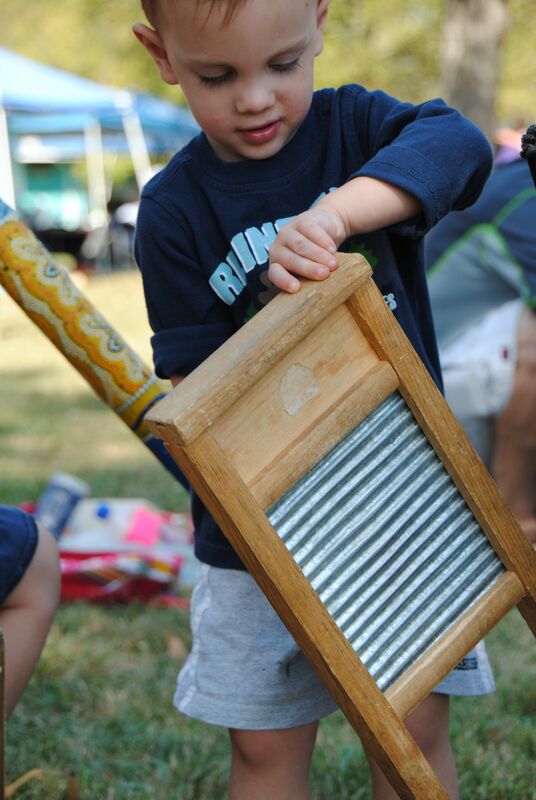 Getting outdoors and making music are two great activities for children of all ages – especially when the weather is wonderful! 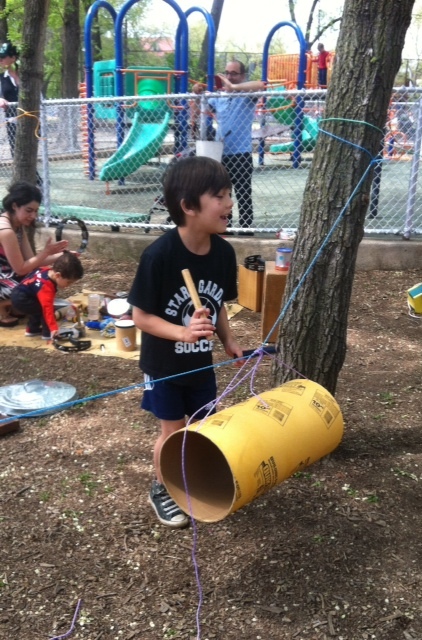 If you have a special tree with low branches in your backyard or local park you can easily create a living musical sculpture for outdoor play. If not, no worries. 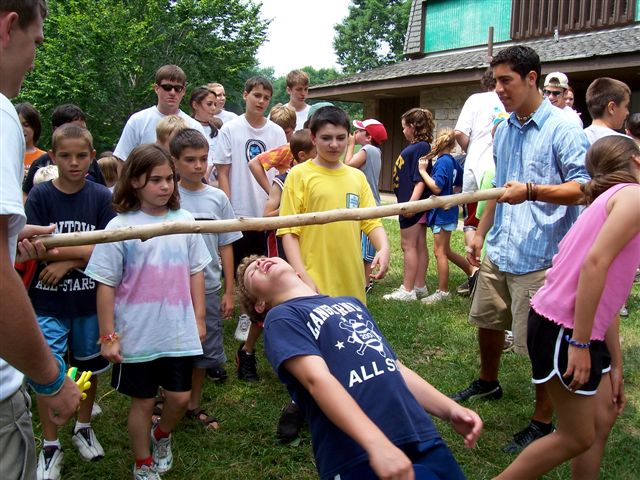 Almost any playground, driveway or open space can accommodate a sturdy clothesline that will easily transform into a magnificent musical monstrosity just as easily! 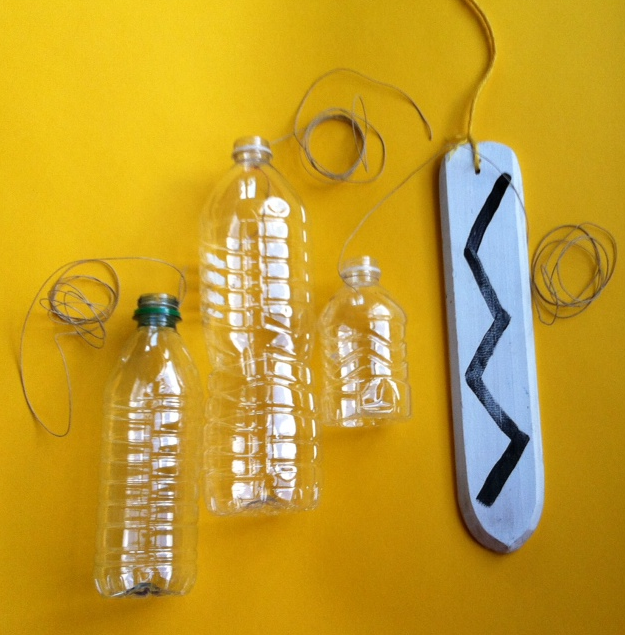 And the best part of this project is that you already have everything you need to create a truly unique music tree or rhythm clothesline right in your garage, home basement and recycling bin! 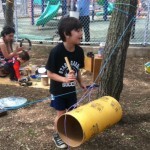 If you’re making a musical tree, find some sturdy twine or rope to hand the instruments. If you’re making a rhythm clothesline, you’ll need a longer, sturdy rope that will reach across your desired area. We’ll describe a variety of instruments perfect for this project and you can pick out what you want to create. Or come up with some of your own awesome ideas! The pipecleaners help smaller children attach instruments without the need of knot-tying skills. A basket for mallets keeps the area neat and organized. If you make the instruments or gather the things you want to hang in advance, this project makes a fun activity for a party, family event or gathering of homeschoolers. What better way to start off a musical session than banging a gong. Take a used serving plate or aluminum turkey roasting pan, decorate and hang for a homemade gong. (A complete Chinese gong craft is in the resource links below as well). 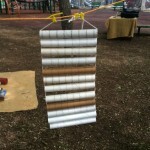 If you’ve collected paper towel rolls, you can string them together and create something that looks like an oversized washboard. Dragging a stick, mallet or whisk over the ridges will result in a wonderful “brrrrrrrrrrrrrrr” sound. 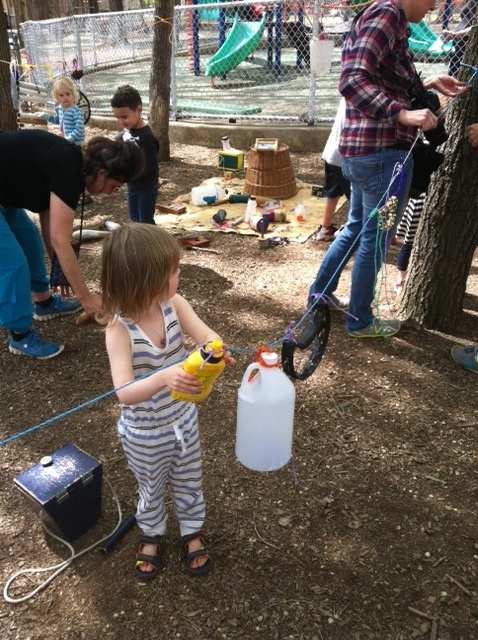 Filling up any clean gallon jugs or similar recycled plastic containers with things that ring or jingle makes a great addition to this project. Add actual jingle bells; if you have them, or look for pebbles, birdseed, dried macaroni or similar objects that will ring, ding, whoosh or swoosh when the jug is tapped. 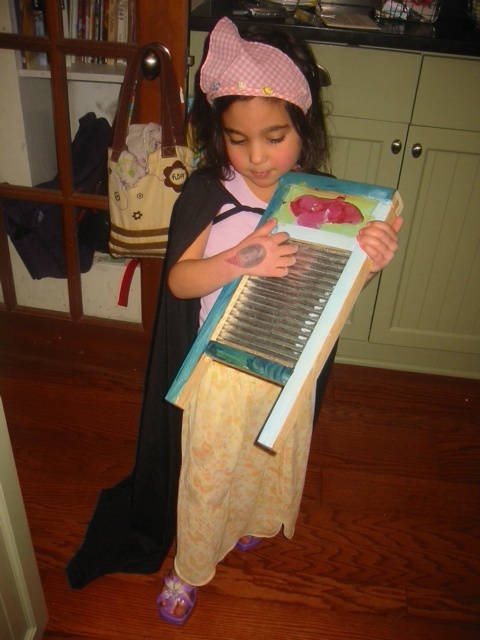 Do you have any older or almost discarded musical instruments? Any broken wind chimes? These sound great when attached to the tree and played. What else do you have around the house? Here we found a large roll used to mold concrete in our garage and put it up so that it could be played like a hanging log drum. What other items or objects can you find that might make some neat noise? Obviously, you can tap the instruments hanging from the tree with your hands. 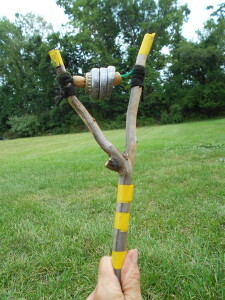 But you can also make some mallets and show the kids how to play each item in new and different ways. Great mallets can easily be created from wooden dowels, sticks, unsharpened pencils, chopsticks or similar objects. Most mallets used in world drumming have some kind of “head”, and this not only creates a better sound but helps kids move away from the concept of poking or hitting with sticks, to the idea of using them as real tools and instruments. 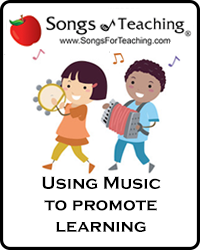 Kids can get really excited about this project so it helps if the adults or older kids model different ways to play the instruments and encourage the kids to listen and try different techniques instead of just hitting or banging away. For instance, tapping the gong in different places and in different ways results in distinct sounds. Using two sticks to play a large tube can create some amazing rhythms. 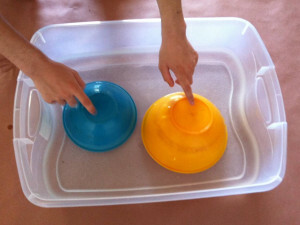 Tapping different jingling jugs can make a series of different sounds that are like musical notes. Dance and Drum, All Around! 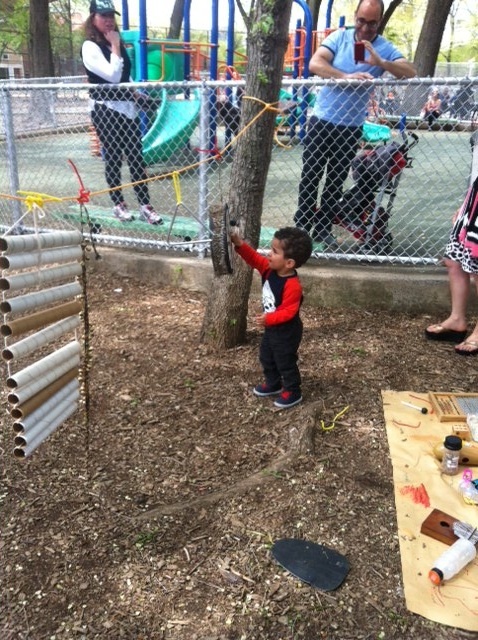 And, in addition to instruments hanging up, you can create things like jingle sticks or sistrums made from tree branches to dance and play around the musical sculpture. Don’t forget that you can also bring or make drums to play beside the tree. You can create free form rhythms or you can sing and play the tree or clothesline at the same time. Invite someone who plays guitar or another instrument to come and be part of the fun. 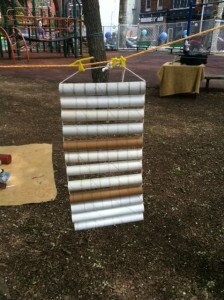 Or bring a music device and play recorded music as a soundtrack for your creative percussion. Listen, learn and love it! What different ways will you play?